Hello! Today I bring you an interview with the very lovely author of Chasing the Dark, which was published by Chicken House in May. 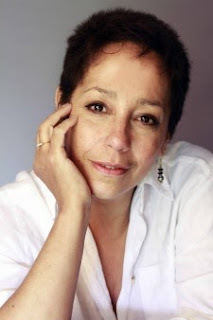 Sam Hepburn is a pen name for Sam Osman and she uses the different names to separate her children's series from her teen mysteries. Do you use mood/inspiration boards or write to any particular music? I wouldn't call it a mood boar exactly but I ferret away news clippings, scraps of information, snippets of overheard conversation and strange objects and think about them when I am devising plots and characters. I also draw a lot on the weird and wonderful people, places and things I saw during my twenty years as a documentary maker for the BBC. I don't write to music either but I do stare out of the window a lot and watch the strange comings and goings in my street while I'm thinking things through. Sometimes the dramas going on outside are far crazier than anything I could invent. What has been the best experience so far of being a writer? Opening a jiffy bag and seeing a copy of something I've written for the very first time is always pretty amazing. Which book or books are you most looking forward to reading in 2013? I've enjoyed reading Sophie Mckenzie's books for teens so I'm really looking forward to reading her new thriller for adults, Close my Eyes. As far as dead ones go I think it would have to be Charlotte Bronte. I once made a two part drama documentary about her life and it is almost impossible to believe that anyone who led such a narrow, cheerless existence could have written such powerful books. As for living authors, I think meeting Harper Lee, author of To Kill a Mockingbird would be pretty amazing. 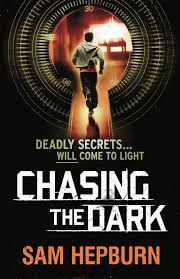 Yes, I'm a bit claustrophobic and there is a kidnap scene in Chasing the Dark in which the main character Joe and his friend Nina are locked in a freight container. I get a bit breathless just thinking about it! Hmm . . . that's difficult, but I think it would Katniss Everdeen or Jane Austen's Emma. I like my friends feisty! If readers love Chasing the Dark, do you have any recommendations of what they should pick up next? Tanya Byrne's Heart Shaped Bruise is a subtle, interesting YA thriller that I enjoyed very much. Another thriller - watch this space! Great interview! I'll have the add this book to my wishlist. Opening a jiffy bag and seeing books that you've written sounds amazing, I'd love to do that one day. :) The trailer is amazing! Thank you so much for those brilliant answers, Sam! And I'm super impressed with that trailer..